Does the idea of marketing your business make you cringe? Do you hate promoting yourself? Self-promotion and marketing have always felt alien to me. I don’t want to tell people: “Hey, listen to me. I’m awesome. Hire me, please.” It feels icky. But I’ve learned that marketing doesn’t have to be pushy. You can promote your business with grace, and still sell bucket-loads. I’ve done this now for several years, and I’ve sold out all my courses. Stop putting the spotlight on yourself. Stop thinking of yourself as the center of your marketing. Instead, make potential clients feel they’re the heart of your story. Let them bask in glory. When were you last fully engrossed in a story? When we read stories, we root for its key character. The amateur sleuth trying to solve a murder mystery. The refugee trying to make a living abroad. The action man rescuing his ex-wife and falling in love again. We support these heroes in their quest for freedom, love, or justice, and we identify ourselves with them. There is nothing more powerful in a Story than having a lead character desperately pursuing something. The reader or viewer cannot help but attach himself to that character because he has objects of desire too. If the lead character in a Story gets what he wants, our brains are wired to believe that we can too. And this is exactly why stories are so powerful in marketing. We make readers believe that their desires can be fulfilled … with our help. In his book “The Story Grid,” Shawn Coyne describes the arch plot as the most popular story plot. The arch plot is a quest in which the hero aims to achieve an object of his desire. This “object” can be external: find a prince to marry, discover the holy grail, or conquer the enemy to achieve glory. The desired “object” can also be internal: overcome grief, find inner peace, become confident. The arch plot fits marketing perfectly because our products and services also help our clients solve their problems and transform their lives—no matter how big or small these changes are. And just like in fiction, plots in marketing stories often combine an internal with an external quest. In one of the most powerful advertising campaigns in history, Apple showed a simple, hip, fun character who just wanted to take photos and listen to music and write books next to a not-so-hip tech nerd who wanted to talk about the inner workings of his operating system. The campaign positioned Apple Computers as the company to go to if you wanted to enjoy life and express yourself but felt intimidated by all the tech talk. What was the internal problem Apple identified? It was the sense of intimidation most people felt about computers. When you think about your marketing story, start by defining who your hero is—who is your favorite client? Then consider which problem you help him solve or how you transform his life. What’s the internal and what’s the external transformation? As a Yoga instructor, for instance, you may help clients move more graciously and feel calmer. Or as a nutritionist, you can help people lose weight and nurture self-love. As a marketing coach, you may help your clients make more money while they also gain confidence as entrepreneurs. How does your story start? In a fiction story, the opening scene gives readers a first glimpse of the battle ahead. That’s how you hook your readers—they want to know who will win the battle. But in marketing storytelling, we don’t think in scenes. We have less time to engage our readers. So, the start of the story is simpler: Our hero realizes he wants to solve a problem. He has worked out what he desires. By mentioning this problem or desire in a headline, we connect with readers and draw them into our marketing story. It’s a mistake to think that, as marketer, you create desire. Instead, you connect with a desire already swirling around in your client’s mind. So, the aim of your marketing is to make your reader feel confident that you can help him achieve this existing aim. You invite him to join you on a journey. When you position yourself as the hero in your marketing, your sales pitch becomes pushy. Your role is important, but you’re not the lead character—that’s your client. Your role is to be his guide and to help him on his transformational journey. Your client’s transformational journey starts with the realization he wants to solve a problem. And the journey ends at a sunny destination where the client feels happier, more at peace, or better off. He has gained the object of his desire. Whether you offer coaching, a course, or offer a service like web design or copywriting, your role as a guide is to offer a clear plan or blueprint to help your client achieve his aims, to reach the sunny destination. You promise you can help him out and you tell him exactly how you’ll do this. So, to create persuasive marketing content, describe the process you go through with your clients. How do you work? What do you deliver? And how will your customer feel at the end of the journey? Each piece of content helps tell your marketing story. You demonstrate your role as guide, boost your credibility, and, above all, you explain how you help your clients reach their aims and transform their lives. Each piece of your content reinforces and explains your role as a guide on your client’s journey. You give readers the belief that he can transform his life, with your help. A story ends when you’ve painted the picture of your hero’s transformation, when his quest for the object of his desire ends. But you can’t let your marketing story end like that. The purpose of your marketing is to begin a relationship with your reader, and ultimately you want to sell your service or product. Is your reader ready to buy? Your call to action can be to buy or to contact you for a quote. Is he not ready to buy yet? Your call to action is to download a report or an ebook. My favorite option to start a relationship with a reader is to invite him to join a educational email series, so you can show him your credentials as a good guide. Here is nearly every story you see or hear in a nutshell: A CHARACTER who wants something encounters a PROBLEM before they can get it. At the peak of their despair, a GUIDE steps into their lives, gives them a PLAN, and CALLS THEM TO ACTION. That action helps them avoid FAILURE and ends in a SUCCESS. Marketing is about your customer. So, stop thinking about marketing as self-promotion. Instead, think of your client as the hero. How do you transform his life? It really is about a connection Henneke. I put myself in reader’s shoes before writing or creating or publishing, seeing stuff through their eyes and adding my personal experience to guide them. Win-win. My know-how and their desire-problem-dream mix, create a sweet 1-2 for telling more captivating stories. Yes, I agree! It all starts with understanding your customers, putting yourself in their shoes, looking at your website through their eyes, and wanting to sincerely help them. I’m glad this came just at the right time, Ali. Happy storytelling! I eagerly wait for your emails. Though the tips you provide seems well known and simple ones, that’s my responsibility to tell you that those little things brought a beautiful change not just in my writing style but in my thinking style. But what if the services or products offered by any website are not on par with the quality as our content? You always have to deliver what you promise so if your marketing sounds better than your service, then you have to either improve your service or adjust your marketing. Now see, I was always taught promote promote promote sell yourself, brand yourself. But this makes sense – marketing is all about the customer. I get it now! Thanks so much. This is beautiful and it focuses on the needs of the client. This changes everything. Thank you, Henneke! I’m glad you like it, Ruth. 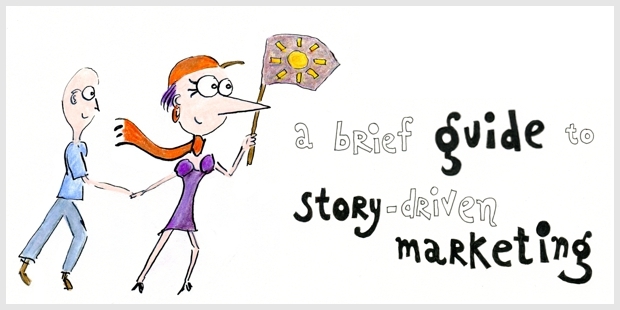 Happy marketing and happy storytelling! Thank you for stopping by. Donald has really helped us wrap our brains around using a story for marketing. Great book. Great writing as always Henneke! Miller’s book is a good introduction to marketing and storytelling. I’m glad you liked it! This blog is absolutely engaging and informative. I need to know more about how to write a proper cover letter/proposal for a freelance copywriting job bid? I will be highly obliged if I get to know the proper method of how to submit a proposal to attract client’s confidence. I’m glad you enjoyed this blog post, Manaj. I haven’t written a blog post about writing proposals / quotes, but the key is showing you understand your client’s business aims and how your work will contribute to their success. It’s a funny coincidence, but I was teaching my yoga teacher training group about basic marketing. I mentioned much of what you talk about. I also shared this article with them. I love Donald Miller’s book that you mention in the post too. Thank you for sharing this article (and for stopping by!). I do love it when commercial blogging involves more than just salesmanship, like surprise and wit and beauty. And even compassion. Just like in selling IRL it’s about people liking one another, too. Right? Like Ryan says. To me it all starts with compassion and listening to our customers. If we don’t understand their dreams, wishes, fears, and struggles, then we can’t connect with them. And it’s about being yourself and letting your personality shine (so you can attract the people that are right for you). That’s where the wit and beauty and surprise come in? Thank you so much for your lovely compliment, Roshni. Happy marketing! Marketing is storytelling, so if you or your marketing team don’t already understand that then you are throwing money away. Gone are the best where people buy just cause they see a 50% off sign. That’s been and gone. The brands that do marketing well are the brands that create stories (and the emotions associated with them) rather than ads. I’d say the brands that do well are the brands that think of their customers’ needs, and sincerely want to help them. This is also the basis of good marketing and also the basis of good storytelling. It is so easy to forget who is the most important person. Having been an N.L.P. therapist for 30 years one thing always holds true. The client has the solution, not me. My job is to guide them to find ‘their solution’, it never fails. Let the customer have the control. Yes, just like in your example of therapy, it’s a mistake to think that marketers are in the power position. The customers have the power to decide, and as marketers we supply the right information to empower people to make the right decision — to only buy the product when it’s right for them. This is such a great post, Henneke! I’ve know that marketing was about centring your client and showing how they can solve their problems, but there are a few phrases and sections here that are so great because I feel like they encompass so much about how to do that in practise. => so easy to remember, so I hope it will light up in my brain whoever I start to drift into positioning myself as the hero in the future. => This section feels like a website blueprint in a single, concise paragraph. => it reminds me that my marketing stories always need to have a defined next step that I direct people towards — whether it’s an actual sale or just a further step along the road to relationship with them. Thank you so much for your comment, Alison. It makes me happy because it was exactly what I set out to do: (1) present a “fix” to make pushy marketing more enchanting and (2) show how each piece of content plays a role in your marketing. Have you read Donald Miller’s book? If not, you may like it. It’s more marketing than storytelling but it’s a good intro. Thank you so much for the post, it was a real eye opener. I’ll use the post as a guide from now on. Thanks Henneke, I really hate promoting myself 🙂 But may I ask how you go about getting testimonials? Most of my customers are so busy running their own businesses that they do not have time to write a testimonial for me. I could take your other approach and go into the stories of how I help others. – What were your expectations of the course? What were you hoping to achieve? – How exactly did the course meet or exceed your expectations? Which parts of the course did you find most valuable? – How has the course changed your approach to writing? Has the course made an impact on your business? Do you remember how I told you one of my daily tasks is “Read Henneke”? It’s because your writing speaks to me directly–I feel like you read my problems and write about them. When I first read this piece, I was about to rewrite the copy on my writer website. And self-promotion is a big deal for me. In fact, I find it so uncomfortable that sometimes I prefer not to write anything at all. After reading this, I decided to take the plunge. You made it so clear to me why and how I should promote my services. And you explained it using a language I understand best–stories. Thank you so much, Henneke, for the inspiration. Keep writing. Whenever I sit to write content, I assume that my reader is sitting in front of me and I have to draw his/her full attention towards my words. Another part is when I write reviews and comparison I used to try to guide my reader with pros and cons as well, so I should not reflected as seller always. What do you think Henneke about my view. Yes, that’s it. You’re like a guide or a mentor, especially for reviews.